Yes, yes, it’s not Thursday anymore, but, I don’t subscribe to your limiting ideas of the days it’s acceptable to post a Half Nekkid Thursday post, so I’m posting mine on Friday! Plus, I’ve been moving and I wasn’t really online much at all yesterday, so cut me some slack! Okay, well, now that that’s out of the way… I’m not sure what possessed me, maybe it’s just being in a new city and thirsting for change of any type that I can get my hands on, or maybe it’s just time that I let my long hair go, I’m not sure, but I cut my hair the other day. I’ve been changing it a lot lately, as you may or may not have noticed. 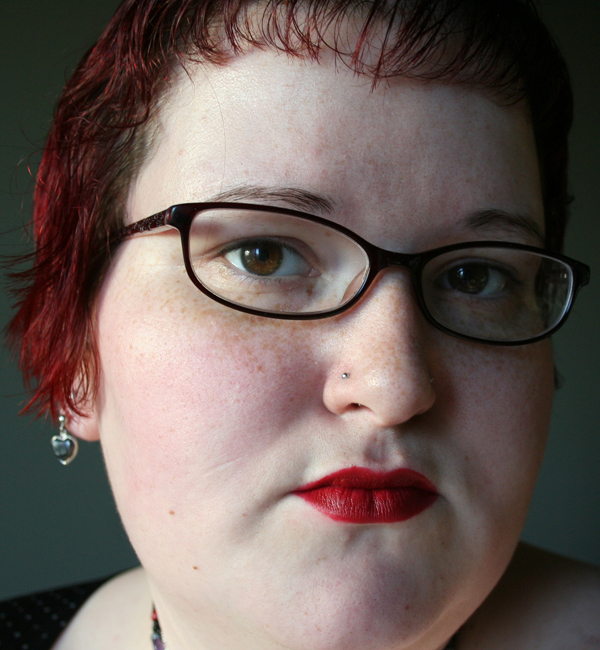 Not too long ago it was bright red and past my shoulders, and when I wasn’t finding any jobs in SLC I decided to get it to a slightly more normal color. Shortly after that I decided to cut it to a little above my chin, which is where it remained until Tuesday night when I cut it myself, and then Wednesday I had it professionally trimmed/styled. It’s been shorter than this before (amusingly enough that picture was also taken in Seattle). I’ve shaved my head before as well, and I used kept it about this length, or anywhere from one to three inches, for many years. A few years ago I decided to start growing it out, and watched it fall to chin-length, shoulder-length, and, finally, past my shoulders. 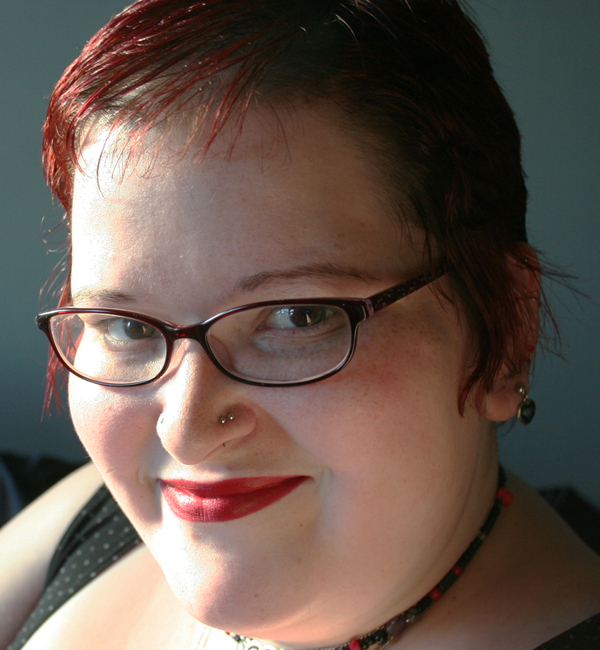 Maybe it’s something about the Pacific Northwest that makes me want short hair, I don’t know, but something made me desire short hair, and specifically to be able to do my hair up into a fauxhawk. I wanted a cut that I could have look femme if I chose or put up in a fauxhawk or otherwise spike or slick to be boi-ish or fagette-ish. So that’s what I did. 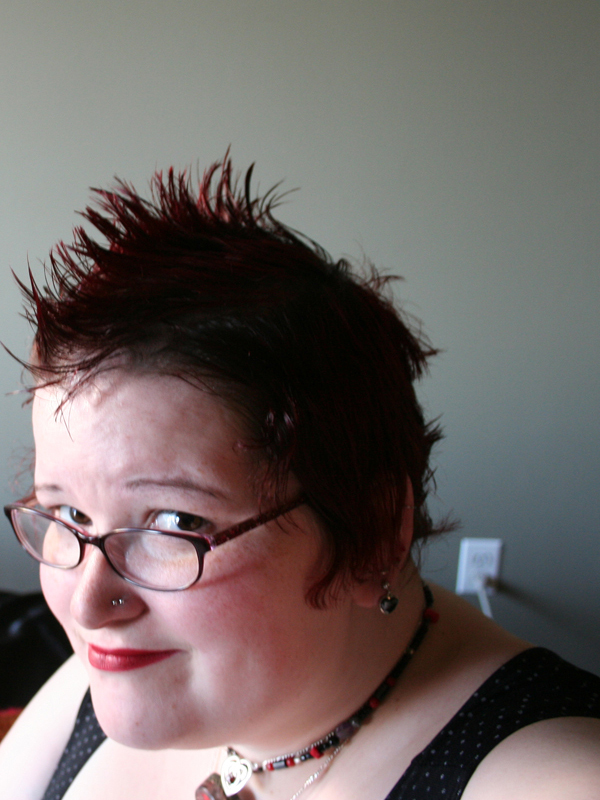 I decided that fauxhawk + lipstick = fagette (though that’s one of infinite combinations, of course). BTW- Love your new faux maux!